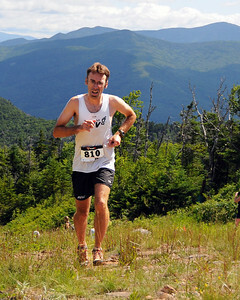 The Loon Mountain Race was held at Loon Mountain Resort, in Lincoln, NH, on July 8th, 2012. This year's race was also the Women's US Mountain Running team qualifying race for the World Mountain Running Championships, to be held in September, at Ponte di Legno, Italy. 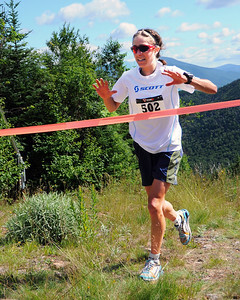 Brandy Erholtz, of Evergreen, Colorado, realizes she's made the US Women's Mountain Running Team, with a 3rd place finish in The Loon Mountain race, which was held at Loon Mountain Resort, in Lincoln, NH, on July 8th, 2012. 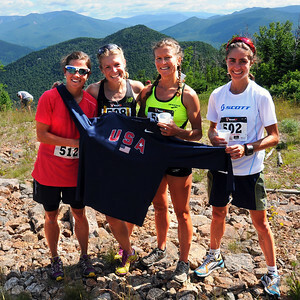 This year's women's division race was the Women's US Mountain Running team qualifier for the World Mountain Running Championships, to be held this September in Ponte di Legno, Italy. Ms. Erholtz finished with a time of 48:06. 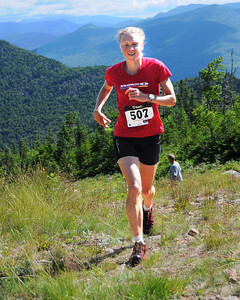 Kasie Enman, of Huntington, VT, competed in The Loon Mountain race, which was held at Loon Mountain Resort, in Lincoln, NH, on July 8th, 2012. This year's women's division race was the Women's US Mountain Running team qualifier for the World Mountain Running Championships, to be held this September in Ponte di Legno, Italy. Ms. Erholtz, who graduated in 1997 from Manchester Central High School, and is the 2011 Women's World Mountain Running Champion, just missed making this year's US team, with a 5th place finish, and a time of 48:49. Morgan Arritola (#502), of Ketchum, Idaho, arrives at the finish line, to win The Loon Mountain race, which was held at Loon Mountain Resort, in Lincoln, NH, on July 8th, 2012. This year's race was also the Women's US Mountain Running team qualifier for the World Mountain Running Championships, to be held this September in Ponte di Legno, Italy. Ms. Arritola qualified for the US team, with a winning time of 46:16. Morgan Arritola (#502), of Ketchum, Idaho, and a group of the best women mountain runners in the country, compete in The Loon Mountain race, which was held at Loon Mountain Resort, in Lincoln, NH, on July 8th, 2012. This year's race was also the Women's US Mountain Running team qualifier for the World Mountain Running Championships, to be held this September in Ponte di Legno, Italy. Ms. Arritola went on to win the women's race, and qualify for the US team, with a time of 46:16. 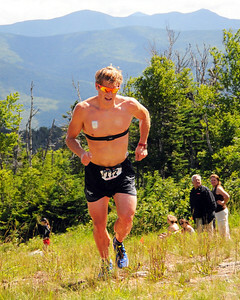 Kris Freeman, of Thornton, NH, finished 2nd, in The Loon Mountain Race, held at Loon Mountain Resort, in Lincoln, NH, on July 8th, 2012. Mr. Freeman, a 3 time U.S. Winter Olympian, finished with a time of 1:14:15. Kevin Tilton, of North Conway, NH, nears the end of The Loon Mountain Race, held at Loon Mountain Resort, in Lincoln, NH, on July 8th, 2012. Mr. Tilton finished in sixth place, with a time of 1:16:49. By finishing in the first four spots in The Loon Mountain race, which was held at Loon Mountain Resort, in Lincoln, NH, on July 8th, 2012. these runners (from left), Stevie Kremer, of Crested Butte, CO, Brandy Erholtz, of Evergreen, CO, Melody Fairchild, of Denver, and race winner Morgan Arritola, of Ketchum, Idaho, qualified for the Women's US Mountain Running Team, which will compete in the World Mountain Running Championships, to be held in September in Ponte di Legno, Italy.